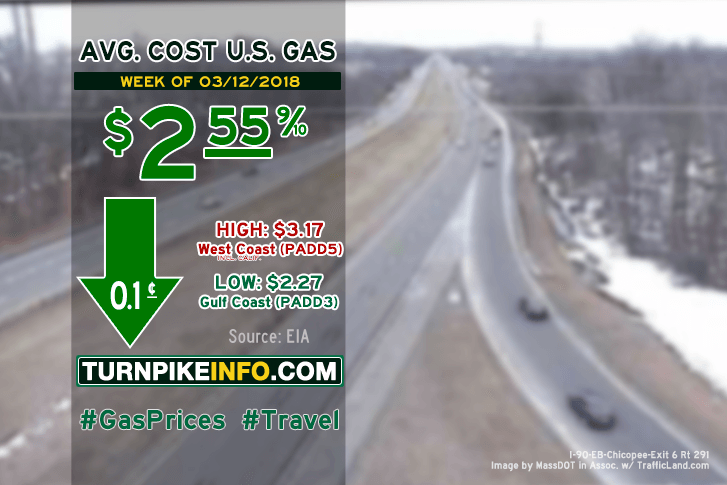 Fort Lauderdale, FL – The average cost of gas went down for many drivers across the United States, according to this week’s gas price survey from the U.S. Energy Information Administration. However, price surges across some regions kept the national price average in check, holding the figure to about $2.56 per gallon. Drivers saw bigger price dips across the Lower Atlantic and broader East Coast, according to this week’s price survey. Prices fell nearly four cents across the Lower Atlantic and about three cents across the East Coast. A sudden uptick in prices hit drivers in California, while a smaller hike struck across the general West Coast region. Truckers got better news across all regions, with this week’s E.I.A. survey. Aside from California, where prices were flat this week, prices declined in all regions, according to the report. The average cost of diesel is now about $2.98 per gallon, the second consecutive week the fuel has cost less than $3.00. Fuel prices for all regions are shown below, as gathered from www.eia.gov.